Did you know that your Chihuahua could actually benefit from wearing clothes? Chihuahua’s are one of the smallest breeds of dogs out there. Due to this Chihuahuas are not able to tolerate cold temperatures like bigger dogs can. In fact, if your Chihuahua is out in the cold for too long it can even affect their health! Because of this, dressing your pet in Chihuahua clothes is actually a good idea when the weather starts to turn cold. You could dress your Chihuahua up in a funky warm sweater! Not only stylish but it also could be lifesaving. It’s important to note that your pet may not enjoy wearing Chihuahua clothes straight away. The best way to overcome this is by slowly getting your Chihuahua used to wearing things. The best way to get your Chihuahua used to wearing clothes is to start by letting them wear the item for only a short period of time. During this period sit with your Chihuahua and reward them with praise or even a little treat. Repeat this a number of times until you feel your Chihuahua is comfortable wearing clothing. Overtime it will become second nature to your beloved Chihuahua, and they won’t mind popping on that cute sweater for a walk outside. Picking out clothes for your Chihuahua. Will your Chihuahua be comfortable in the outfit? Yes it may look awesome, but will your Chihuahua actually enjoy wearing it? Do you know what size clothing your Chihuahua will require? For instance Chihuahuas can weigh anything from two pounds to over five pounds, so, look for items that cater for your Chihuahua. For instance clothing may be labeled four to six pounds. If your Chihuahua fits in this range, then these are the items to go for. So remember this when picking out Chihuahua clothes, as again, you want your companion to be as comfortable as possible! Some Chihuahua clothes may be labeled ‘one size fits all’. This may seem okay, but again check that your Chihuahua is actually comfortable wearing this item. Even though it may be ‘one size fits all’ it’s still important to make sure it isn’t too big or too small on your Chihuahua. There are so many amazing special occasion Chihuahua clothes out there! For instance you may want to dress your Chihuahua up as a pumpkin for halloween. Or maybe as a little reindeer for Christmas? Yes, these ideas are really, really cute but again will your Chihuahua be comfortable? These outfits are a lot different and bigger than the little sweater you may get them to wear on colder days. So as previously mentioned, make sure your Chihuahua is comfortable in the costume before you make them wear it for the day. 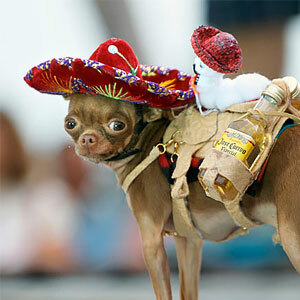 If your Chihuahua shows distress in anyway then you should take the costume off immediately. There you have it – some great advice on Chihuahua clothes! Have fun shopping for your beautiful Chihuahua… but remember your Chihuahua’s comfort MUST come first!